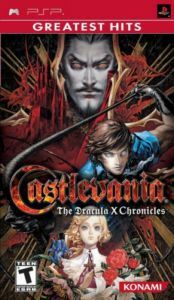 Set in in 1792, Castlevania: The Dracula X Chronicles follows Richter Belmont as he battles to return Dracula to the oblivion from which he came. Having seen his beloved Annette kidnapped by his vampiric nemesis, Richter and his loyal friend, Maria, must wield the legendary Vampire Hunter whip and fight through the tainted countryside and enter Dracula's Castle to stop this horrific scenario from destroying humanity. As befits the first PSP Castlevania title, Castlevania: The Dracula X Chronicles brings the PC Engine classic to life with all-new 3D graphics but retaining the original side-scrolling gameplay. Players are charged with battling through more than 10 stages as either Richter or Maria, each with their own unique skills and battle abilities. 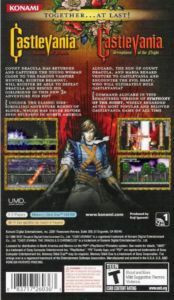 Similarly, to add replay value, Castlevania: The Dracula X Chronicles lets players return to stages they have previously completed to compete for high scores or rare items. In addition to new 3D graphics, Castlevania: The Dracula X Chronicles also boasts new character designs by renowned Castlevania artist Ayumi Kojima, and introduces a new sound collection feature that will let players unlock music to listen to, and assign as they wish to produce their bespoke soundtracks.